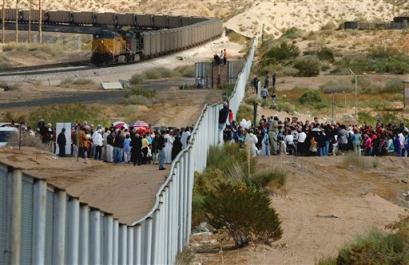 Obama has indicated that he will not try to pass an immigration bill this year. This should come as no surprise. Obama wouldn’t want to touch a divisive issue like immigration reform during an election year, especially since he failed to politically benefit from “health care reform”. However, this news has provoked dismay among some pundits, who want the federal government to pass an immigration bill ASAP, in order to head off any more toxic state legislation, like the awful bill that was just passed in Arizona. To be honest, I can’t see our government passing an immigration bill that isn’t terrible. As I pointed out in my last post, the only practical solution to this problem is to grant legal status to undocumented workers. Neither of the major political parties is willing to call for this. No one in the mainstream media is willing to advocate for it. Instead, we get endless delusional talk about “sealing the border”. What’s more, because the Democrats won’t abolish the filibuster rule, the Senate is now virtually controlled by two right-wingers: Joe Lieberman and Ben Nelson. (Lieberman seems to be going off the deep end. His demands are becoming more and more capricious every day. I’m waiting for him to have his Joe McCarthy moment.) If the Senate ever passes an immigration bill, you can bet it will have all sorts of “anti-terrorism” amendments, vastly increasing the powers of the police. An interesting side note: according to some reports, the Tea Party movement seems to be on the wane. I don’t think this should be surprising, considering that there’s no real political substance to the movement. I bet some of these people really believed the sky was going to fall if the “health care reform” bill was passed. Perhaps they’re feeling a little foolish right now, as well they should. This entry was posted on May 9, 2010 at 9:24 pm and is filed under Democrats, Immigration, Obama. You can follow any responses to this entry through the RSS 2.0 feed. You can leave a response, or trackback from your own site.